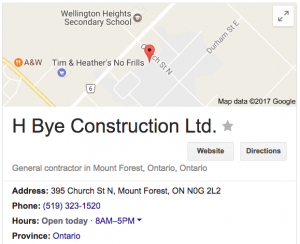 As one of the longest running Mount Forest construction companies, HBye Construction has built themselves an excellent local reputation over the last 60 years. They provide a large variety of agricultural, commercial and industrial services, and we did our best to showcase them all in an easy to use wrapper for their clients. As part of service package we also updated their Google business profile listing to help all the calls they receive. It’s a fact that all business owners should have a Google business listing that not only influences better local Google search results but also makes it easier for leads to contact them with a simple Call Now button in Google Maps. A benefit you’ll note in the image below is that Google Business logs how many calls, visits to website and request for directions correct listing setups receive = measurable marketing results! With lots of great imagery and content provided by the HBye team, we were able to work together to create a website that we believe will help their clients to find and contact them online in a convenient way that showcases their true colours. 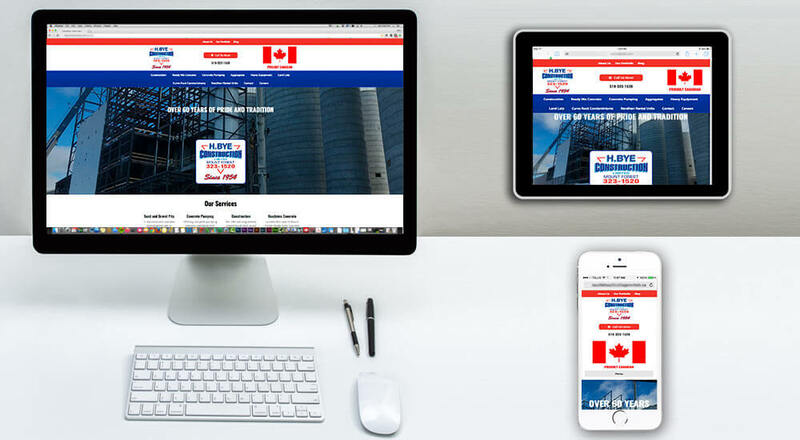 They are very proud of their time serving the area, the quality and rate of their Mount Forest ready mix concrete and we wanted to make that apparent in the experience of the website. Traveling to Mount Forest was a fun and productive experience, it gave us an opportunity to meet the HBye team and to get a tour of the beautiful Mount Forest area. We’ve had a great time working with the HBye crew and hope to continue to help them to grow their presence online in the same way that they’ve done so well in their local community, with care. If you’re a Mount Forest business that would like to increase your internet business exposure to specific target markets, give us a call at 519-387-9322. I read this article and found it very interesting, thought it might be something for you. The article is called Mount Forest Web Design for HBye Construction and is located at https://www.gemwebb.com/mount-forest-web-design/.